Has anybody else run into this and have a solution? I'm subscribed to Google Play music. 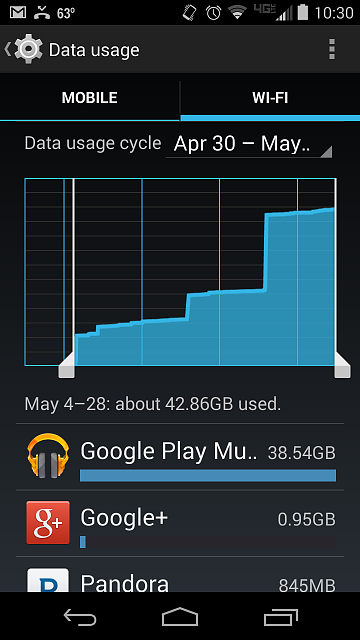 I have not used it at all this past month and it has transferred over 38GB over wifi. Luckily I have background data restricted to wifi. I still can't figure out why it would be transferring so much data when I'm not even starting the app or using the app at all. Oddly, it seems to be increasing over time. 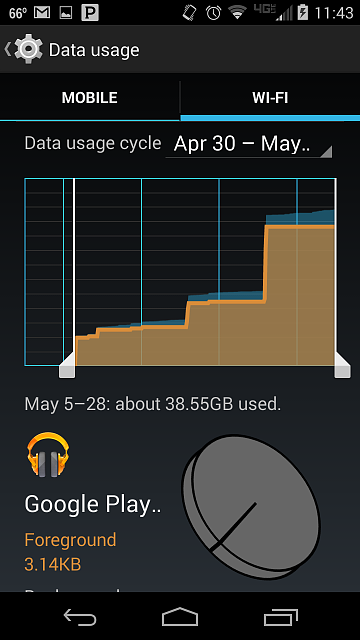 I haven't done anything on any of my other devices (laptop and tablet) either using google music. I've never had this happen to me so I'm just guessing. Maybe you have automatically cache turned on and it's being over active? Try to clear cache and app data. Is it possible it's syncing local music files to the cloud? I don't think it is sync'ing my local music on the phone because it show's I have 0 songs uploaded out of the 20,000 I'm allowed when I look at my account from a pc. I don't see any options to upload or sync from the google play music app. I just turned cache off and cleared the cache in the app. I'll see if that helps. Google Now search bar widget..